Explanation: How could a galaxy become shaped like a ring? The rim of the blue galaxy pictured on the right is an immense ring-like structure 150,000 light years in diameter composed of newly formed, extremely bright, massive stars. That galaxy, AM 0644-741, is known as a ring galaxy and was caused by an immense galaxy collision. When galaxies collide, they pass through each other -- their individual stars rarely come into contact. The ring-like shape is the result of the gravitational disruption caused by an entire small intruder galaxy passing through a large one. When this happens, interstellar gas and dust become condensed, causing a wave of star formation to move out from the impact point like a ripple across the surface of a pond. 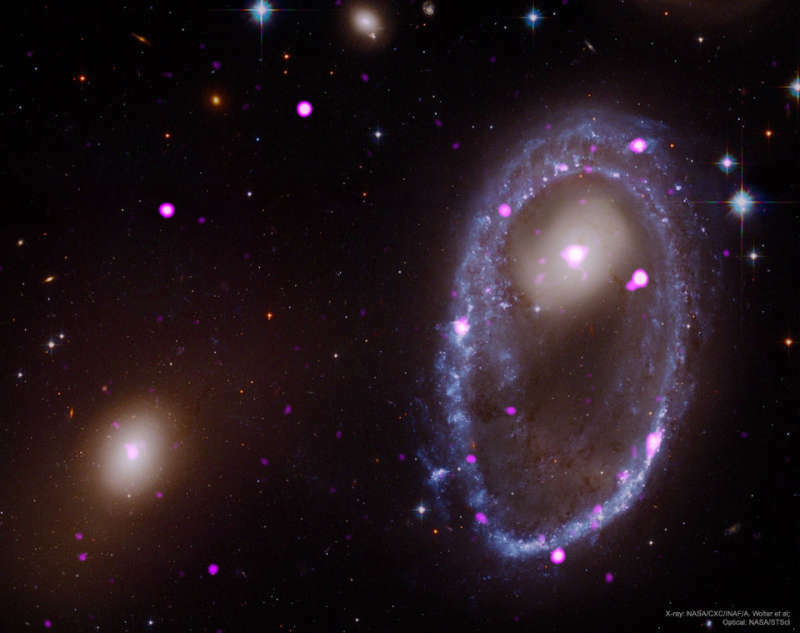 The likely intruder galaxy is on the left of this combined image from Hubble (visible) and Chandra (X-ray) space telescopes. X-ray light is shown in pink and depicts places where energetic black holes or neutron stars, likely formed shortly after the galaxy collision, reside.